Do you want to get your weightlifting or workouts done properly? Want to lift more than ever? Even if you think you’re unfamiliar with weightlifting shoes, you’ve probably seen them without even realizing it. These are the wedged platform sneakers that you see Olympic powerlifters wearing. They offer a lot of benefits and can really help you improve the way you lift. If you don’t have a pair or are looking for a new pair, there are plenty of options. However, choosing the best pair can be challenging. To help you make an informed purchase decision, the top five weightlifting shoes have been compiled and analyzed based on out testing. If you are a lady, be sure to check out weightlifting shoes for women guide. Adidas Adipower Click For Adidas Adipower Price Best overall. Perfect for heavy lifting. Inov-8 Fastlift 325 Click For Fastlift 325 Price Stable and robust but also lightweight. The Adidas Adipower shoes are considered to be some of the best weightlifting shoes available on the market. They’re quite popular with professionals and amateurs alike and for good reason. They feature a TPU (thermoplastic polyurethane) heel for increased stability. The shoes also include a reinforced PU-coated rubber which makes the shoe more durable and flexible while also providing great ventilation. Unlike others reviewed here, this shoe is not a hybrid lifting shoe. It’s a shoe designed purely for lifting heavy weight making it one of the best lifting shoes around. So it isn’t recommended for other workouts like CrossFit, although some claim otherwise. The shoe weighs around 16 ounces which is considered a little heavier than other top brands but still lighter than others. They allow you to plant your foot properly without holding you back in terms of mobility by feeling too heavy on your feet. In terms of the heel height, the Adipower features the standard ¾ of an inch raise giving you stability and support in your squats and deadlifts. As previously mentioned, the heel is made of TPU. This is a lightweight, yet rigid material that is considered the greatest material for workout shoes. The material makes the weightlifting shoes durable and sturdy as well as abrasion-resilient. With TPU shoes you won’t have to worry about the heels compressing under heavy loads or wearing out from frequent use. This can help prevent injuries, too. What makes this one of the best lifting shoes around is that Adidas boasts about this shoe’s weightlifting-engineered chassis that features a solid and stable outsole that allows you to feel your connection to the ground beneath your foot better than other models. This is important in weightlifting since you want to be able to grip the floor as you push. As for the upper part of the shoe, the Adidas Adipower shoes feature PU-coated leather and mesh. The combination of the two makes the shoe breathable, flexible, and long-lasting. Since the leather has been coated, they’re quite resilient to abrasions and rips which can occur from frequent use or mishaps with equipment. If any scuffs do occur, the material can be easily cleaned by rubbing the marks away. The mesh used in the tongue allows for proper airflow to prevent your feet from sweating a lot. That being said, when we tested them, there were times that we wished that they were a little more breathable. While the shoes are flexible, they do take some time to properly break in, as most weightlifting shoes do. Users have said that it actually took them over a week of constant wear to get fully comfortable in these. However, once they did break them in, the shoe is said to conform perfectly to your feet creating a supportive and snug fit. Unlike older Adidas models, the Adipowers feature one strap close to the top of the tongue. While this provides security, some lifters prefer additional straps or a lower strap. This is more of a personal preference as the combination of the strap and the laces here seem to be quite sufficient. It also makes for a sleeker minimalist design. The Adidas Adipowers are some of the best lifting shoes are available in a variety of different colors and in a wide range of sizes so there is something for everyone. All in all, these shoes are considered to be one of the best pairs to buy thanks to their durability, their functionality in the weight room, and the techniques used to create them. Known for their wide range of fitness shoes, Inov-8’s FastLift 325 is one of the few different weightlifting shoes the brand makes. Like the other models, this one is known for its minimalist design as well as its ability to perform well in the gym. This makes them some of the best weightlifting shoes that are also multipurpose. They’re lighter than other shoes but also feature a lower heel height (around .65 inches). This lower heel height is considered beneficial as it makes it a little easier to transition through different movements while training. The Inov-8 325 shoes provides solid stability and is made with the same TPU PowerTruss construction that is used in other top brands like Adidas and Nike. This shoe is also breathable thanks to a lightweight mesh used in the design. While they don’t feature leather like stiffer weightlifting shoes, they still give you support while being easier to break in and a little more comfortable. The shoe only comes in all black or black with slight orange accents. If you’re new to powerlifting or are just a casual lifter, the Adidas Powerlift 3.1 are a great choice. They are lighter than the typical weightlifting or powerlifting shoes (around 15 ounces) and resemble more of a cross trainer. This makes them a useful transition shoe that can help you get used to standard weight lifting shoes without shocking your feet too much or requiring frequent use to break in the shoe. They are some of the top weightlifting shoes for those who are new to this type of footwear. Similarly, if you do CrossFit or similar workouts, these can be used for that due to their hybrid nature. It has a slightly below average heel height of around 0.6 inches, but that is what makes it an effective hybrid shoe instead of a strict weightlifting shoe. While the typical ¾ inch heel height is effective for squats and provides additional stability, this lower heel height makes this shoe more versatile. So you can use it during other workouts instead of stopping to change your shoes. Similarly, this won’t make you feel like you’re falling forward when transitioning from power movements to strength movements. The heel is made from a lightweight, yet durable material called high-density EVA. This is a quality material but not as durable as TPU which is used in other Adidas weightlifting shoes. EVA compresses more than TPU which can be a problem when lifting heavier weights. This change was done to make the shoe appealing to people who practice cross-training and aren’t solely powerlifters or weightlifters. As far as the rest of the shoe goes, it’s made of mesh and lightweight leather making them airy. The open toe box allows for good flexibility, too. While the mesh is great for breathability, there is also mesh around the upper part of the heel. This can make the shoe too flexible for some people who prefer more stability in their heels. In terms of the strap, the Powerlift 3.1s have one thick strap around the top of the tongue to keep your feet secure. While some lifters like multiple straps for additional security, the thicker size of this strap actually offers more security than other shoes that have one thinner strap. This shoe comes in a wide range of sizes as well as multiple colors including standard white and black and flashy colors like bright yellow, red, and blue. While this might not be something you’re concerned with, having different designs to choose between can be a nice way to make your weightlifting shoes more personal. In terms of the price, you can often find these for a cheaper price than most lifting shoes. This updated version of the Reebok CrossFit Lifter was released back in 2014. This improved on its predecessor in many different ways. It’s more of a hybrid shoe than a strict weightlifting shoe making it more versatile. If you participate in CrossFit, this is a great CrossFit shoe for you since it combines the functionality of a weightlifting shoe with that of a fitness sneaker. For example, if you are doing CrossFit and your WOD has weightlifting exercises in it, you can use these shoes instead of worrying about not having the stability you want from a standard fitness shoe. 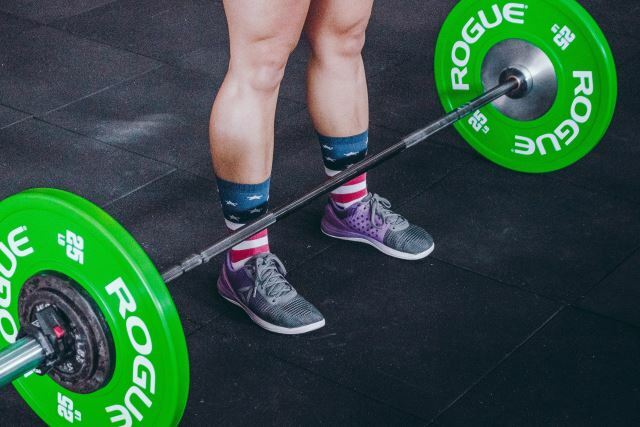 While some hybrid shoes use a lower-than-average heel height to make the shoe versatile, the CrossFit Lifter 2.0 features the standard ¾ of an inch heel raise. This will give you the support and stability for deep squats and heavy lifts. Unlike the original CrossFit Lifter, the heel in this shoe is made of PEBAX TPU making is softer than other shoes while still being durable. That being said, it’s also slightly more compressible than heels made of a TPU construction. In addition to this, the shoe doesn’t have the perfectly flat sole that most weightlifting shoes have. Instead, the sole resembles that of a normal running shoe. The overall material of this shoe is synthetic leather and mesh creating a breathable shoe that can help prevent your feet from sweating as much during a workout. Users report that the material feels less stable than other top brands but since the shoe is supposed to be for more than weightlifting this is to be expected. For security, these shoes feature one metatarsal strap made of synthetic leather. This is different than its predecessor which features two straps for additional security. When combined with the laces, this strap can help you achieve a tight fit that will help you feel stable and secure as your train. The Reebok CrossFit Lifters come in 10 different colors and a wide range of sizes which makes them suitable CrossFit shoes for women as well as men. According to users, they are true to their size and considered to have a normal width. This means that if you have a wide foot, you might have to get a slightly larger size than you normally would or opt for something that is made for people with wide feet. This might come as a surprise to you, but the ever-popular Chucks are a great weightlifting and cross-training shoe. Featuring a canvas body with a thick vulcanized rubber sole, you get a light shoe that is breathable and durable. They also have an OrthoLite insole that gives you some cushioning for some additional comfort. The eyelets in the shoe also create optimal airflow helping your feet sweat less than they would in other shoes. As you know, Chucks can be used for daily use as a street sneaker, too. This is great if you’re on a budget and really don’t want to spend money on a shoe that would only serve you in one way. With Chucks you can wear them when lifting, cross-training, or walking down the street. 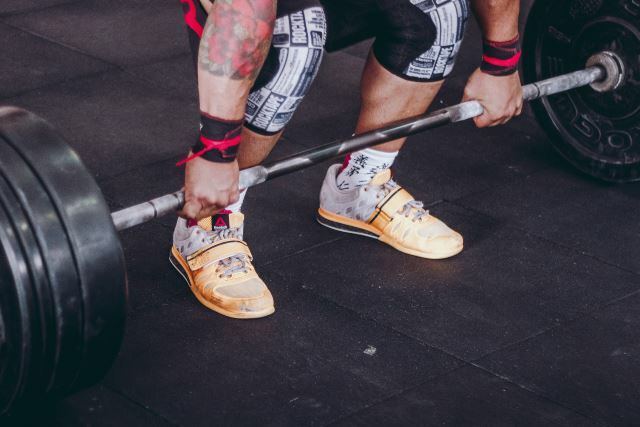 While other versatile shoes tend to lack the overall functionality of a standard weightlifting shoe, Chucks are considered to be one of the best shoes for deadlifts, squats, and bench presses—three of the most common lifts in training. Chucks feature a flat sole to help you plant your feet while the lack of heel cup in the shoe allows you to fully drive into the ground when lifting heavy. While there is no lifted heel like other shoes, the flat, thick sole gives you stability and support without throwing your heels higher. More so, this lack of a heel raise allows you to feel the ground better as you push. You can get a better sense of how your foot is planted and be more aware of your body. Similarly, the lack of heel height will force you to squeeze your legs harder in every lift improving your technique and form as you progress. Think of this as a crutch being taken away from you. When you don’t have that extra artificial support, your body will be forced to support itself and will be stronger for it. There are no straps on Chucks, but they are still quite secure. High-top variations can be laced up the ankle for proper support and ankle compression. As long as you’re tying your shoes tight enough, you won’t even miss a strap for foot security. That being said, there are plenty of powerlifters who use the low-top Chucks tied tightly. Since Chucks are used as a casual shoe, they are found in a wide range of sizes (for both men and women) along with a wide range of colors and patterns. They’re also quite affordable and can be found for as little as $30 USD in some cases. You can buy different ones for different purposes and rotate them during your workouts to get the most out of your purchases. There is no shortage of weight lifting shoes on the market for lifters. A good weightlifting routine can go a long way but whether you’re looking for something to use casually or you’re a dedicated professional weightlifter looking for the best shoe available to improve your training, you’re sure to find something to fit your needs and preferences. 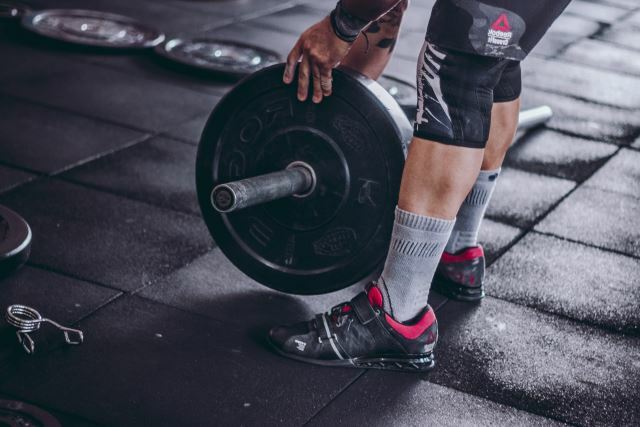 Knowing what to look for and what to avoid in weightlifting shoes can help you shop for a new pair with confidence while the reviews of these five models can help you narrow down your search or serve as a jumping-off point for your search. Remember to compare different models to each other so you don’t settle on the first thing you find. Use the buying guide here and be sure to read user reviews for anything you’re unsure about. One of the distinguishing factors of the top weightlifting shoes is their raised heels. This is a very important feature that plays a big role in ankle flexibility. With better ankle flexibility, you’ll be able to sink deeper into your squats making them more effective without fear of rolling your ankles under the heavy load. This is because while your heels are raised, your body can remain straighter despite dipping deeper in your squat. The improved posture will protect your back and torso from injuries, too, since you’ll be properly aligned. Some of the best weight lifting gloves will have thick padding and offer plenty of support over normal gloves. Similarly, weightlifting shoes’ soles are thicker than other shoes and made of firmer material when compared to normal running shoes. This allows you to push off and land with heavier weights than you could without that support helping you train harder. The shoes are developed to hold their shape instead of sinking under the pressure of your body and the weights. When you wear regular gym shoes while weightlifting the sole compresses due to the weight of your own body along with what you’re lifting. This is likely to throw you off balance which can lead to injuries like torn ligaments and tendons. 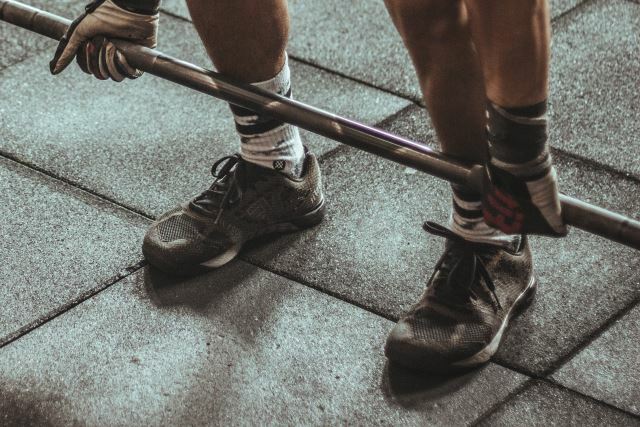 While you can get away with wearing normal running shoes as you lift weights, the benefits of using actual weightlifting shoes instead can help you in significant ways. The stability and support they provide alone are enough reasons to invest in a pair. By decreasing your risk of injury you’ll be able to keep training and improving instead of being sidelined by pulls or tears. Additionally, considering that powerlifting competitively (and lifting in general) isn’t an overly expensive activity, investing in a quality pair of weightlifting shoes is more than worth it. When shopping around for weightlifting shoes, there are always certain things you should keep in mind. The last thing you want is to have a poorly made weightlifting shoe fail you during your lifting session. Knowing what to look for in a quality product will ensure that you’re spending your money well while also getting a shoe that will function properly in the moment. 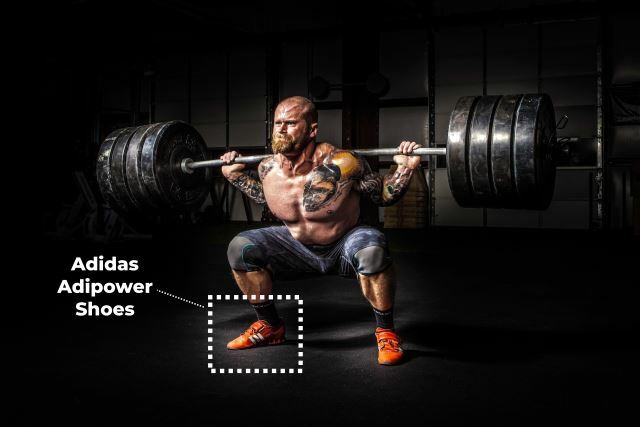 As you shop for your next pair of weightlifting shoes, keep these features in mind and see how your options shape up against them. Since the main benefits of a good pair of weightlifting shoes are the support and stability they provide, you obviously want to make sure that the pair you pick is designed to support heavy lifting. If shopping in person, be sure to check the quality of the soles and check that the shoe is stiffer than a normal running shoe. If you’re shopping online, you can read reviews to see what users have said about the shoes in terms of its stability and support. In general, the best weightlifting shoe will be rigid enough that your ankles will feel supported while the sole won’t sink under the weight of your workout. They should also offer support for your knees through that stability. 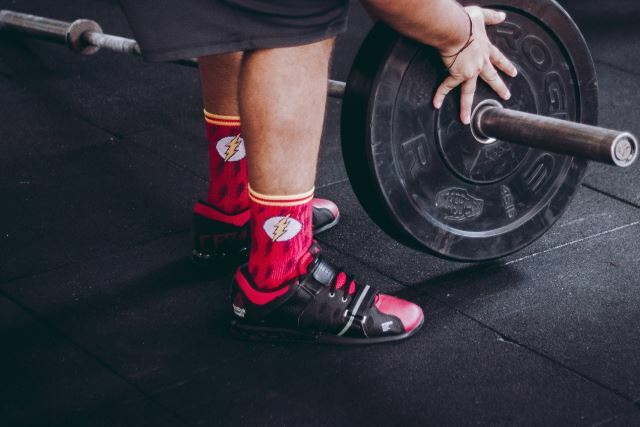 If you know you need high levels of support for your feet and knees, making sure that you choose a weightlifting shoe that is more rigid is a better choice for you. 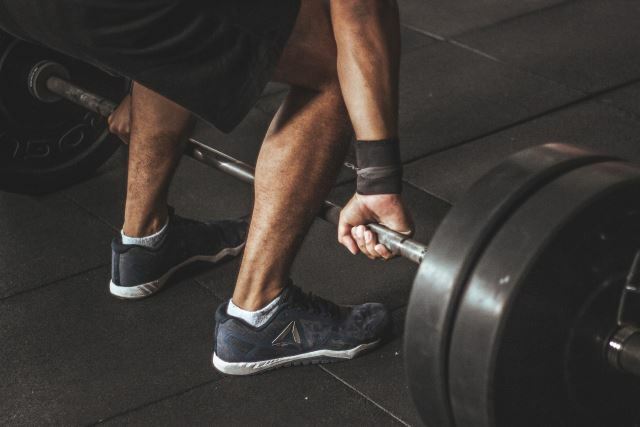 While a lot of newer models use modern materials, there are weightlifting shoes that still use wood in their designs to make them firm and rigid. That comes down to personal preference, though. Instead of focusing on the material used, just make sure that the sole doesn’t compress easily. Your new weightlifting shoe should be able to support your body weight and the weight you’re lifting. Most quality shoes are made of materials that can withstand heavy loads and maintain their shape and firmness for a long period of time. You should keep your own lifting capacity in mind. If you know that you’re constantly upping your poundage, you want a shoe that can keep up with you as you increase your load. When shopping, you will be able to tell the quality of the materials by physically holding and trying on the shoe. However, if you’re like most people and doing most of your shopping online, you can usually find the materials of the lifting shoe somewhere in the product description or you can research the product and see what materials the manufacturers used. User reviews may also make mention of this factor with people discussing how the shoe held up in their own training sessions. When you’re buying any kind of shoe, you have to make sure it fits properly. Even if you plan to buy your weightlifting shoe online, consider stopping by a physical store to try the shoe on before buying it. You don’t want to find a great shoe and then have to keep sending it back because it doesn’t fit right. If you push into a shoe that is too small for you, it can pinch your toes and feel uncomfortable. This can hinder your ability to properly lift your weights or cause you to shift in the middle of a lift and injure yourself. On the other hand, wearing a shoe that is slightly too big can affect your stability as your foot will splay out too much as you dig into the floor. This lack of stability can affect your form and technique and lead to injuries. When checking the size, the shoe should fit the length of your foot, obviously, but it should also fit the width of your foot properly. In weightlifting shoes, the toe boxes are sometimes narrower than regular gym shoes. This can cause pain or discomfort if you have a wider foot so you have to take that into consideration when buying your pair. Here, reading the user reviews can help a lot. People will sometimes say whether they were happy with the fit or if they recommend you buy a half-size or more up or down. Similarly, the product description might tell you that they run big or small and how narrow or wide the toe box is. In terms of the finish, you have to make sure that the shoe you’re choosing is durable enough to withstand the strain on them as well as the frequent use they’ll face. They shouldn’t lose shape or wear out quickly. As long as the shoe is made of quality materials this shouldn’t be an issue, but it’s something to check out before investing any money in a shoe. Now, this is the most subjective feature that you should consider when buying a weightlifting shoe. If you’re serious about your training, you more than likely don’t care what your shoe looks like. 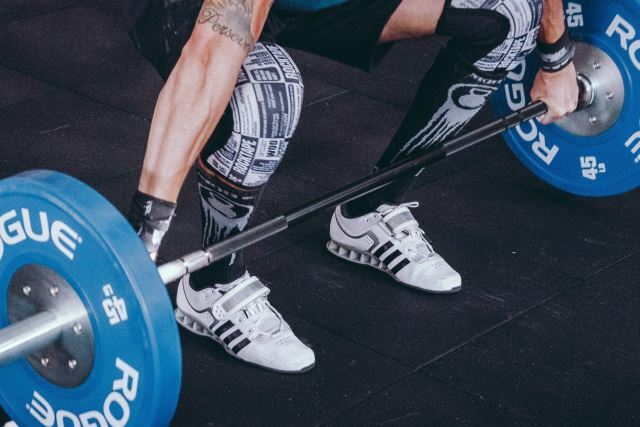 However, in a world where fashion is considered as much as function for things like shoes, brands have created stylish looking weightlifting shoes to fit people’s personal preferences. If this is something that would sway your purchase decision, take the patterns or colors of a shoe into consideration. Different models may also vary in heel height with some having higher heels than others. This is an important part of the shoe’s design since it’ll affect your ability to generate power as well as leverage. Most quality weight lifting shoes have a heel height of around ¾ of an inch but there are ones with higher and lower heels. Consider your own needs and preferences and choose a shoe with a heel height to match them. Finally, the materials used should also be considered. As it’s already been mentioned, the better the materials used the better the shoe. If a company uses cheap materials, the shoe can wear out quickly and won’t withstand the stress you’ll be putting on them. The material should also be breathable so your feet don’t sweat too much. If you can’t physically examine the shoe, do some research on the particular shoe you’re looking at and see what materials were used to make it. Like anything you buy, you have to take the price of the product into consideration, especially if you’re on a budget. You might find a great pair of shoes but they might be too expensive. Similarly, you might be stuck between two shoes with the price being the determining factor. In general, weightlifting shoes are more expensive than other athletic shoes, but they’re worth the investment. Here, you just want to make sure that the shoes you pick are worth their price. 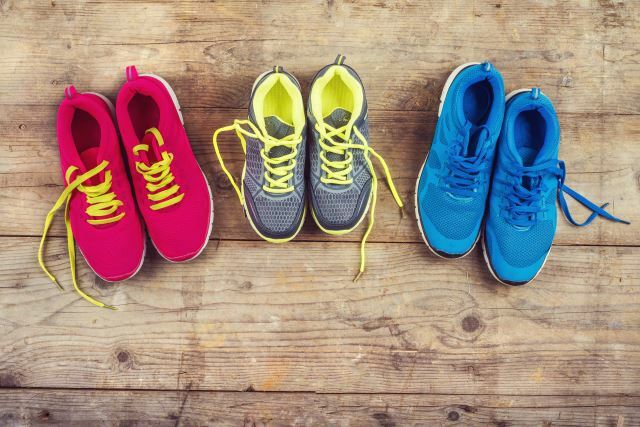 As you shop for a new pair of gym shoes, examine the shoe (or at least the product description) and figure out how each potential purchase matches up to these conditions. Make sure your final decision matches all of your preferences and requirements while also fitting into your budget. You can do the same as you read through the five reviewed weightlifting shoes here.